Everything You Need to Know About Air Travel. Questions, Answers, and Reflections. 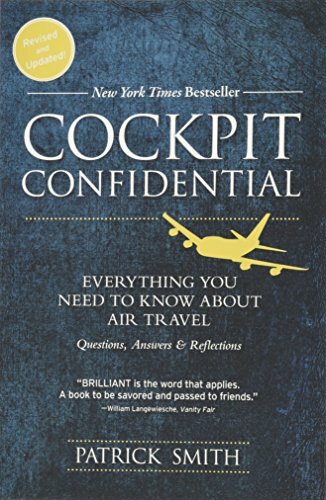 The questions below are taken from the author’s book, Cockpit Confidential: Everything You Need to Know About Air Travel. Questions, Answers, and Reflections. There are dozens more in the book’s seven chapters. A revised and updated edition was published in June, 2018. We are told that planes basically fly themselves. How true is this? What’s with those annoying safety briefings? Is Qantas really the safest airline? And if not, which is? How are pilots evaluated for raises or promotions? Why do between the US & Europe go far north, sometimes over Greenland? What if somebody opens a door during flight? Why all the rules about window shades, seat-backs, tray tables & reading lights? What’s the lowdown on cell phones and electronic devices? Where are the trickiest places to land? Should we be wary of certain airports? What’s that trail of mist coming from the wingtip? Is it fuel?